Rana Bose is a member of our editorial team. His third novel, Fog, will be published at the end of April. There are many people who relate the concept of “class” to level of income. This is understandable given that a majority of people see “class” as an extension of an archaic English approach towards social “classification” based on upbringing, education, social standing, behaviour, etc., which emerged out of a baron/landlord and tenant relationship rooted in land ownership, inheritance and land exploitation at a pre-industrial stage of development. This affliction of class attitudes, however, was not confined to the countryside and still persists in large cities of the UK, with infinitely boring and goofy behaviour patterns that the English themselves laugh at endlessly. The definitions of class, however, have changed significantly since the mid-nineteenth century and are grounded in the evolution of industrial production. Some have also identified inherited wealth and the lack of taxation on inheritance as additional elements in defining class divisions. Inherited wealth is less of a significant factor in equality when it comes to developing countries, but remains of consequence in the old industrialized nations. However, this income (sheer interest from funds long bestowed down the family lineage) and the resultant inequality provide a “class” basis for social segregation. Thus, affiliations and beliefs about class, rather than definitions of class, have come to influence the discussion. Class has always been defined as a relationship to production and capital. In the mass production industrial realm, the owner of a business (typically in an industry that manufactured commodity goods) acquired wealth by personally running a productive enterprise, hands on. In the current world we live in, however, confusion is compounded because traditional manufacturing has taken flight overseas, leaving behind service, leisure, soft skills and runaway profit-making ventures, often based on speculative capital and leading to escalating compensation for “C”-level executives (CEO, CIO, CFO, COO, etc.). Such executives, who move around amassing 300 to 400% more compensation than the average worker, cause increasing confusion regarding class, the super rich, etc. Why am I bringing this up? Because class is frequently used in a casual manner, and for the past several decades the issue of identity has often been conflated with class to compound matters further and confuse the unity of the poor and the disenfranchised. In the past, this conflation and the resultant confusion ensued in the growth of extreme right-wing movements that led to WWII and the advent of fascism in Spain, Germany, Italy and certain other regions of Europe. The spectre of another such rise seems apparent today. It has terrified even arch-conservative philosophers like Francis Fukuyama (The End of History) to limp along to new conclusions about the Bush era, the Iraq war and the neocon rise and to suggest that the “war on terror” could very well have given birth to a new wave of “identity-bound” intolerance, requiring a “softer” remedy. Sinister as his conversion is (it seems that our government in Canada has also been somewhat inspired by such ideas in seeking a “soft-coup” approach overseas), it is one more deflection from the essential problem that there is a 1% that owns capital and there is a 99% that does not! In the sixties and seventies, the women’s movement and the black consciousness movement were the harbingers of social forces asserting identity as an important and potent weapon in uniting largely ignored or deliberately sidelined sections of the population – uniting against unfair and exploitative relationships practised by the state or against the policies of the state when it came to waging war against other nations in the name of “freedom and democracy.” Thus identity was and has been a significant unifying force against the main adversary, the state and its policies. In both the great wars, the poor mobilized against war based on the understanding that the rich fought wars for resources and expansion. Hatred and intolerance thus became handy tools for inciting divisions among the poor. Genocidal extermination was carried out against Jews and the Romani, and the killing of communists and socialists became acceptable practice in Nazi Germany. It became fair game to cite identity as an excuse to exterminate those who struggled for justice and fairness, against class exploitation. In that context, identity slowly became the basis for disuniting those opposed to fascism. Most of us today live at the junctions of identity and class. “Identity” is generally billed as unifying as a social category, be it race, gender, gender orientation, sexuality, disability or similar factors; and regardless of whether one is poor or rich, identity stands on its own. “Class” usually involves economic factors, including wealth by ownership of the means of production, which enable access to superior health care, housing, education and social status. British filmmaker Ken Loach wastes no time establishing where he stands on “class” being fundamental to understanding social change. See http://politicalcritique.org/world/uk/2018/ken-loach-class-struggle/. In the aftermath of the Vietnam War (in the mid-seventies), a certain triumphalism emerged in left-wing academic corridors. Despite carpet-bombing, defoliating and napalm bombing Vietnam, the United States suffered devastating losses – 60,000 soldiers. The Vietnamese won. The United States was defeated. This had unfortunate consequences for political philosophy, as some came to realize. A period of intellectual slackness emerged as academics found ways and means to define social conflict in terms of identity alone, and the question of class conflict was put on the back burner or regarded as an implicit given, or simply defined as being defunct! While courses on “class” and the economic basis of class continued to be offered, the sexiness of certain excursions into the world of post-colonialism evolved into studies in post-modernism. European philosophers with obscure credentials appeared and disappeared, finding ways and means of dismissing the class nature of social conflict. Often slotting the subject under post-modernist discourse, academic circles were very busy promoting various non-class notions of struggle. 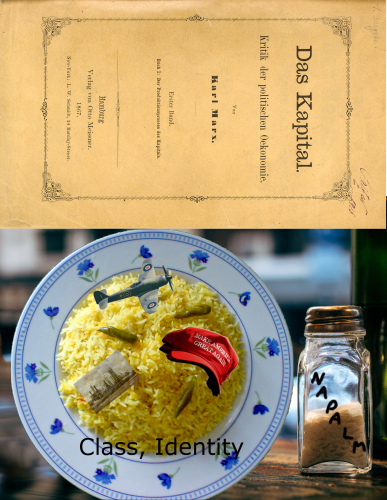 At some point, these courses and their various proponents leap-frogged their ideological tendencies and secured a position as “cultural Marxists.” Many never agreed to such a label, but ideologues from the Right found it very convenient to bash them for their excessive zeal for “correctness.” The results have been disastrous, as we all know. There has never been anything in the annals of Das Capital that suggested a “cultural identity” chapter! But, of course, there has always been a sound basis for “de-hegemonizing” mainstream political and cultural discourse, which has conspired to raise concepts like “freedom, democracy, western civilization, elections, law and order, parliamentary forms of government” as sacrosanct, and assigned an elevated notion of superior rule to them. Many identity-bound movements have consciously or unconsciously bought into such political discourse and hardened their positions on a non-class approach. This is where the disenfranchised and marginalized slotted themselves separately. Whether black or brown or yellow, transgendered, transsexual, gay or two-spirited, the question is: who rules? Look up the Capital chain, friends! One of the horrendous distortions of the new identity crises is found among certain white folks who feel oppressed and depressed about their current state of affairs and have the idea that they’re becoming a minority in certain urban centres! The white supremacist movement has come out, shedding its Klan-hoods and sporting short-sleeved shirts and MAGA caps. And they’re not the only distortion. There are also the men who claim they feel they’re oppressed! Irrespective of the distortions and deflections, the good news is that some of the irreconcilable differences and tensions between class and identity seem to be waning. With the utter failure of the concepts of free trade, globalization and deregulation, there may be new realignments of identity and class due to forces beyond the control of the common person. Flattening economic opportunities (due to intellectual and technical mobility on the web and functionalities related to it), deepening inequality and corrupt political systems where politicians are bought and sold like cattle are upsetting the confidence of the 1%. Mythic beliefs in the old world order and the conviction that the apple cart can never be kicked over and the dream of the “self-made man” still holds true have suffered some serious fender-benders. Class and identity are gradually unifying in many contexts, and even the fact that poor and working-class people supporting Trump have not always done so based on a sense of white privilege but out of extreme frustration with joblessness and poverty has some bearing on the complex relationship between class and identity.